Chronic pain is often poorly understood by health professionals and pain management is under-funded and under-resourced within our National Health Service. As a General Practitioner, faced with a patient with chronic pain and having less than ten minutes to ‘sort them out’, I know from experience it is very easy to reach for the prescription pad (or, latterly, the prescribing screen on the computer), rather than engage in lengthy discussion about perception, thinking habits and physical remedies. From now on, however, I may well recommend this great little book as part of my management of such difficult ‘cases’. 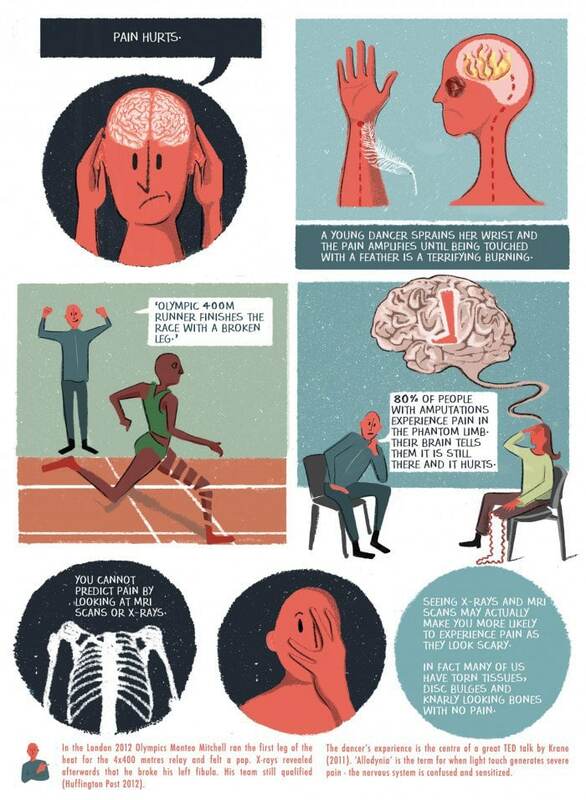 The author, Steve Haines , argues that the experience of chronic pain is a complex problem, involving multiple systems within the body and mind, which is specific to the individual and not easily measured or diagnosed using conventional technology. It is, as the title says, really strange, but understanding it can be the first stage in relieving its effects. The construction of an engaging graphic essay is not an easy task: many who have tried have produced disappointingly text-heavy pages with images that merely illustrate the words. 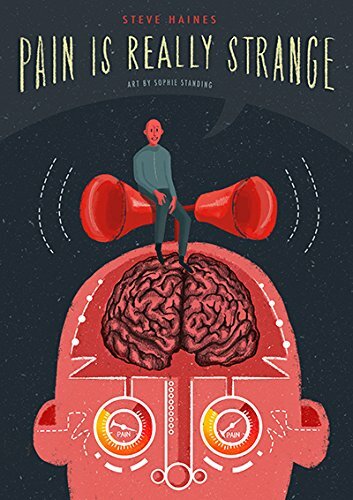 This book strikes the right balance, with Haines’ avatar explaining his ideas, Scott McCloud-style, and illustrations that add to the enjoyment of reading. The graphics are amusing, utilising the playfulness of the comics medium and speeding the reader through the discussion. Sophie Standing’s artwork is very appealing, and I can’t tell how it is done, which is a good sign. It must, I suspect, be digitally rendered, but it looks like a mixture of pastel, pencil and screenprint. Printed on matte paper in full colour, the book is saddle-stitched with French flaps, which gives it the aesthetics of a high-end indie/small press publication. My only real criticism would be that the accompanying bibliography is online, rather than included in the book itself. To be fair, it is set out in two formats: page by page or in alphabetical order, with hyperlinks to the papers, books and websites cited, where there is online availability. While there is a certain logic in to all this, I’d still prefer a bibilography in the book. Maybe I’m lazy, or maybe I don’t like having to switch media in order to view the long-form references. On the website, however, we do find more resources, with interviews and stories that expand on the themes of the book. I have met the folk at Jessica Kingsey Publishers, of which Singing Dragon is an imprint, and I was impressed by what they are doing. They have brought in comics artist and illustrator Mike Medaglia, whom I know from the Indie comics scene in London, to help oversee a series of titles dealing with subjects germane to Graphic Medicine, and I am looking forward to further publications. I learned new ideas from this book. Learning from graphic narratives is one thing, but finding a comic I would actually recommend to patients is a much rarer occurrence. I would definitely recommend this title to those suffering chronic pain or anyone with an interest in this fascinating area.